I’ve been making so many versions of this salad the past few weeks. The different varieties depend on whats standing out at the farmers that weekend. I like winging it, every time the outcome is a stroke of serendipity. For me it always starts with those beautiful potatoes! I spot them and then the gears start turning, am I going the frittata direction, the potato salad with egg direction or the delicious pesto and green veg direction? The snap peas and green beans won out. Plus I liked the idea of having extra pesto on hand for meals later in the week. This is a great prep ahead of time dish that can be assembled a half hour before serving. I like when this dish is served closer to room temperature, I think food has way more flavor when it’s not served cold from the fridge. 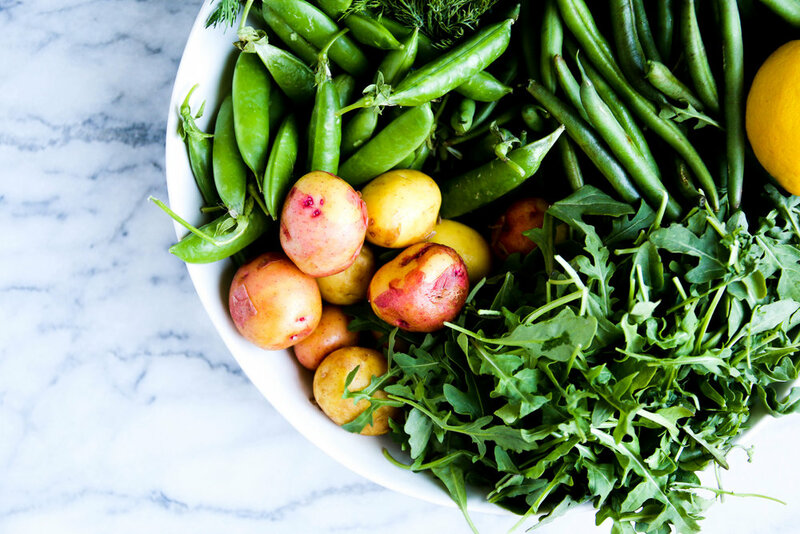 You can easily blanch the snap peas and green beans, boil potatoes and prep the arugula pesto and viola you’ll be the most popular person at the picnic. The summer in Portland has been spectacular so far, warm days, a few showers in the evening, utterly perfect if you ask me. This Thursday is the summer solstice, a perfect night for a long picnic with all the season has to offer. Don’t miss out on celebrating, grab a bottle of rose or something bubbly and festive and take in the longest day of the year. Toast almonds on a baking sheet in 350 degree oven until slightly darkened, 10 minutes. Let cool and coarsely chop 1/3 of the almonds and set aside. In a food processor pulse remaining almonds with garlic, arugula half of Parmesan and 1 cup of dill into a smooth paste. With the motor running stream in 1/3 cup olive oil. Season with salt and pepper. Season a large pot of cold water with salt, add potatoes and make sure they are submerged in water. Bring water to a boil, then reduce heat and cook potatoes at a simmer until done ( time will vary based on the size of potatoes used). Once potatoes are cooked, drain them in a colander, in a bowl toss them with a few spoonfuls of the pesto while they are warm, it’s a great way to help them absorb the flavor. Blanch peas and beans in a large pot of salted boiling water, until bright crisp and tender 3-4 minutes. Drain and transfer to a bowl of ice water and chill until cold. Drain the peas and beans; pat dry with paper towels. Transfer to a large bowl and toss with lemon juice and 3 tablespoons of pesto. Add potatoes and additional pesto, depending on your personal taste, finish with remaining olive oil and season with salt and pepper. Top with remaining toasted almonds and Parmesan. Serve some lemon wedges along side for additional seasoning.